It’s a sad night for three dimensional constructs of dead musicians everywhere. Tupac’s hologram, whose *successful* appearance at Coachella led to talk of similar reincarnations from Elvis, Jimi Hendrix, Jim Morrison, Left Eye, and Freddie Mercury, has died. He was five months old. As CNN reports (via Pitchfork), Digital Domain Media Group, the company behind the Tupac hologram, has filed for bankruptcy. 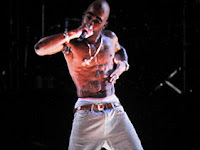 During its 20 year existence, the company worked on special effects for movies likes Titanic and Pirates of the Caribbean, and was also considering a potential tour for Tupac’s hologram. However, that wasn’t enough to negate the $15 million debt that ultimately proved to be its downfall.